Aircel, one of the country’s leading GSM Mobile service providers, today launched the “Pay Per Use” plan for its customers in Andhra Pradesh circle. This is the 6th Aircel circle to offer the scheme, after the recent successful launch of “PAY PER SECOND CALLING PLAN” by Aircel in Kolkata, Karnataka, Orissa, Tamil Nadu & Chennai and Uttar Pradesh East & West circles recently. 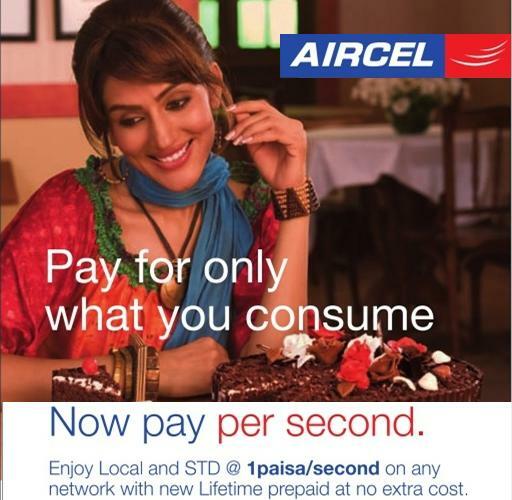 Aircel prepaid customers can now enjoy both Local & STD calls at just one paise/second. These reduced tariffs can be availed for calls made from the Aircel Andhra Pradesh network, to any network within the country. In order to activate, customers need to SMS <ACT ON> to 5800000. Thereafter, all existing tariffs / rate-cutter benefits get cancelled and the charges would be on a per-second basis. With Aircel “Pay per Pulse Plan” there is a limit on the STD usage – upto 1,000 seconds per day will be charged at 1 paise, after which STD calls will be charged at 2 paise per second. To activate One paisa per second. Send an SMS to 58000. But it takes 48 hours to activate. I did just now. Got to see whether this works. Aircel has got its fame again by giving exciting offers and best network. But however Aircel has to introduce Mobile Galleries for Postpaid SIM CARDS IN ALL OVER KARNATAKA.